The playful, majestic mammals humans have come to adore are beautifully profiled in this film by Disneynature. 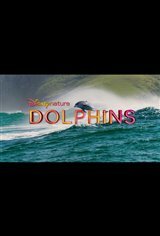 A dolphin named Echo is followed as he learns to survive and find his place among the creatures of the sea. He wrestles with the desire to be care-free and the need to accept new responsibilities as he grows into a contributing member of dolphin society. After all, the coral reef that Echo and his family call home is dependent on the efforts of all its inhabitants to keep it healthy. Along with Echo and his fellow dolphins, turtles, whales, and fish of all s and colors are featured.